Casanova is our sire of champions, many times over. He is one gorgeous male, in every possible respect. His offspring carry his headstyle and coverage and very square conformation, almost without exception. Chilam is probably our most valuable female, period. After all, her last three offspring, all males, are 5X and 4X champions. 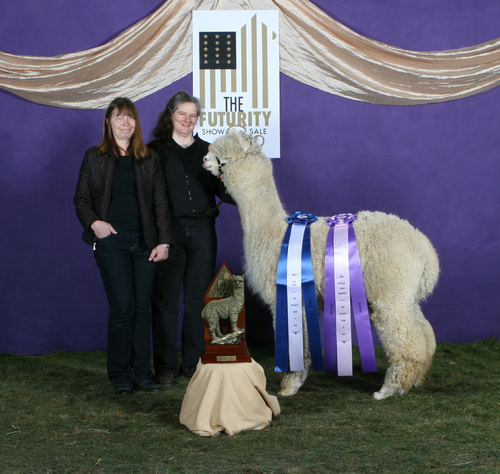 That 5X Champ is our Hidden Hill Peruvian Dually, who won the Color Championship at both 2009 Futurity and MAPACA. 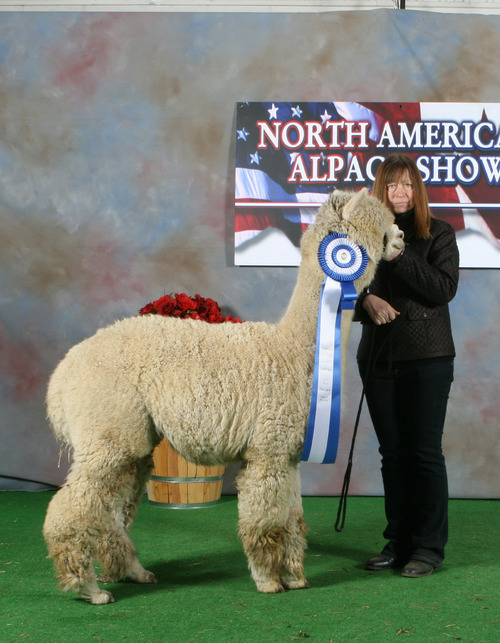 His full brother, Hidden Hill Peruvian Pundit, has four championships from our having shown his first fleece twice. Okay, so Inco has not yet had a banner, but anyone that has seen his fleece cannot believe it. 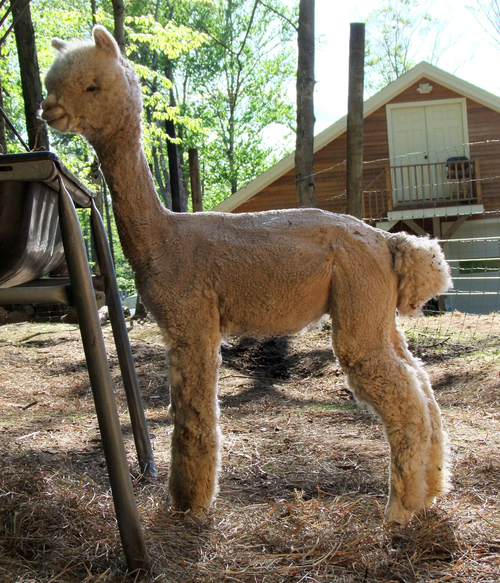 At 3.5 years of age, his fleece remains as fine as when he was a cria! I can go down into the belly, and it's the same, down past the stifle -- and it's the same. This is what we all should be breeding for, truly! Chilam lost condition score after she sustained an injury to her neck, which made her mope about the lush pasture all summer long, instead of grazing as she ought. But she is indomitable, and her neck has realigned, so I am redoubling my efforts at getting her condition score back so we can breed her this spring. And if she wants to produce another male, I cannot blame her, but to have a daughter to carry on for her would be a most welcome thing indeed. 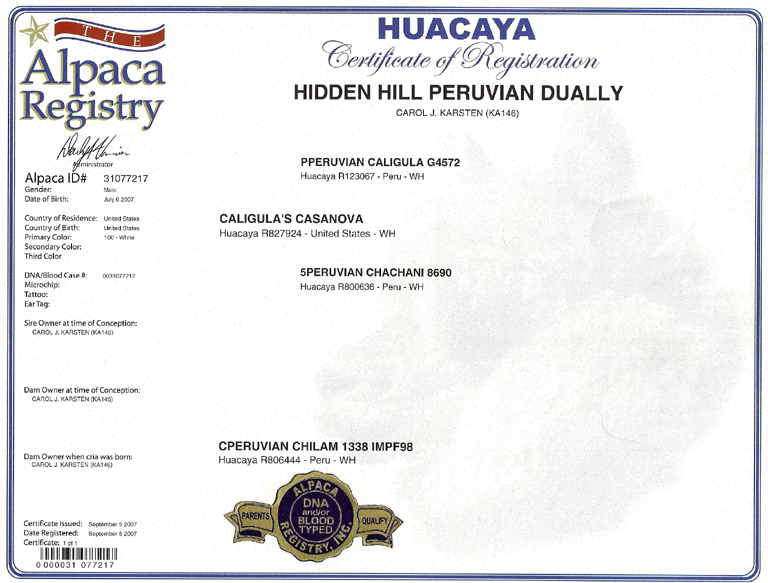 Hidden Hill Peruvian Dually is our home-bred and born 2009 White Huacaya Male Color Champion at AAA Futurity. 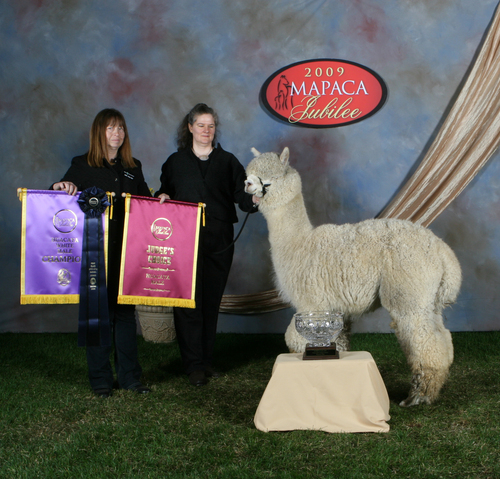 He followed that up with the 2009 White Male Huacaya Color Champion at MAPACA. What more could one want? Well, how about winning Judges' Choice at MAPACA? He's done that, too. In fact, the three times his fleece showed, he took championships and the Judge's Choice. However, with the Futurity championship, Dually has met the best of the west, east and all the rest and he has come out on top. Now, when he took those halter class championships, some very big names placed behind him. We generally do not drop names, but the second place finisher in Dually's class at Futurity happened to be Accoyo America Road Warrior. Is Dually a fluke? Well, his two full brothers are excellent examples that that is not the case, and we can even add that the histograms from offspring of the one other proven full brother are almost identical to those offspring sired by Dually. We are seeing AFDs in the 13-14 range and SD compression below 3 rather consistently! We are seeing quite a few 2-handle SDs among his offspring, and that makes us very excited. This boy is white-hot, with a fleece that is elite among the elites, extreme type, excellent conformation, bite and bone. 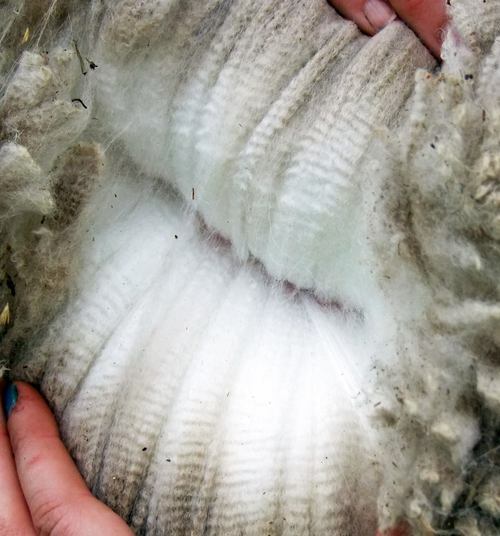 His fleece show scorecards have always shown perfect or near-perfect scores for fineness AND density. 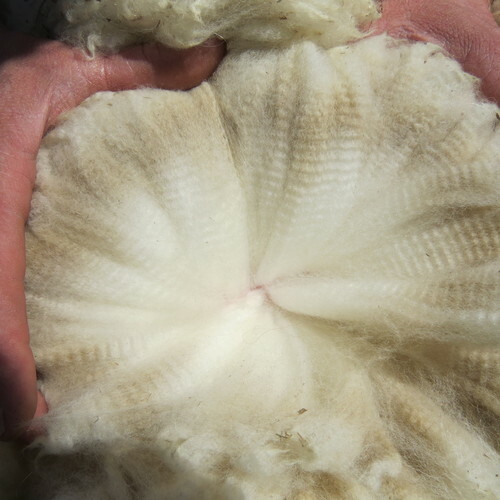 What we particularly like about his fleece is the organization approaches that of a top-quality merino, in that the fleece holds together in a high wind, and the matchstick bundles are discreet. Over time, Dually is holding onto an excellent staple length, not something normally associated with an animal that is also holding fineness. We now know that Dually can throw his type and his elite fleece qualities and does so consistently. Truly, this is a unique line, and it is dam-driven -- if you know what that means. Sure, Caligula is in his pedigree, but his granddam and his own dam are driving this bus!